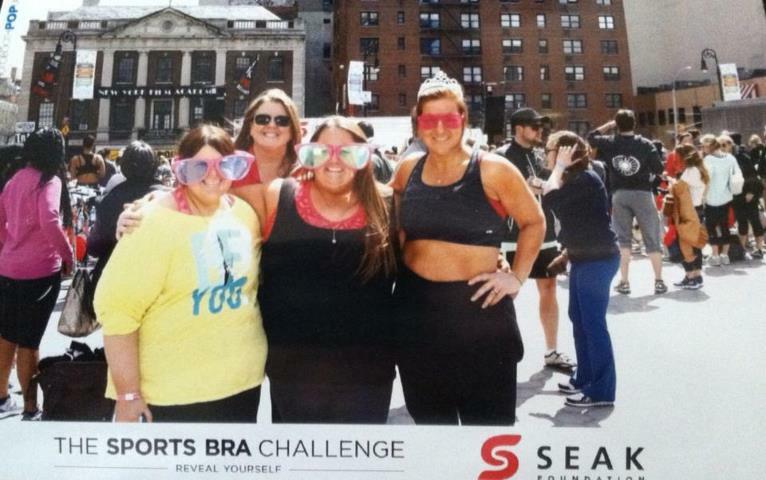 The Sports Bra Challenge….Abundantly MORE than I could have ever asked for or imagined…. The weekend was approaching, Roseanne and Bethany were making all of their plans to come to NY and experience this with me. I was so excited that they were coming. We were just 3 women, out of the hundreds who would be there, who were bringing our individual stories… our issues, our “baggage”, our celebrations, our expectations…our lives….our minds, bodies, spirits….just as we were, at this time, to a place to be together with hundreds of others, to celebrate where we were in our lives that day. 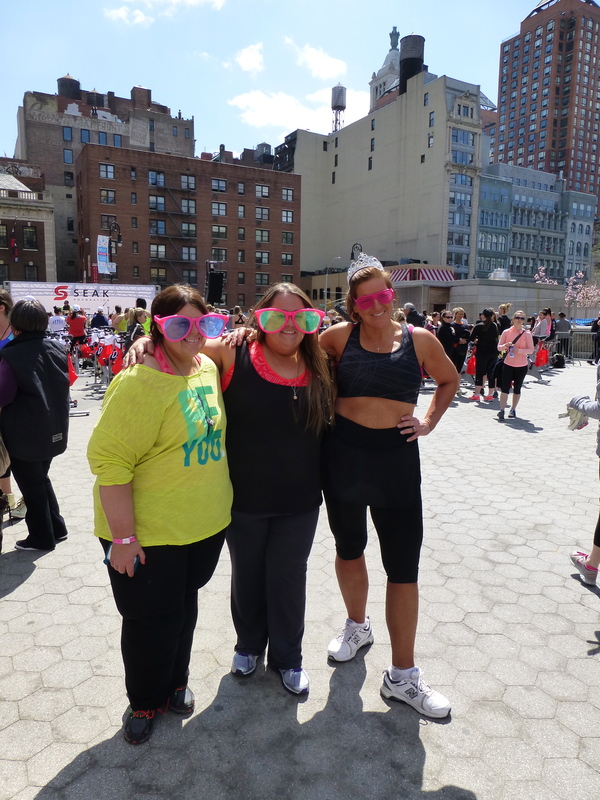 I had dreamed of this day for 2 years, since Olivia and Hannah had announced that they were going, after winning The Biggest Loser..2 years ago, 81 pounds ago, I exercised in my house (alone) to an exercise video, shades down, doors locked, in a sports bra, just to feel a part of that day that was happening in NYC, now I was going to check off a dream that I listed on my “dream/wish list” 2 years ago…..Roseanne was celebrating already being over 111 pounds down, since I met her at Unleash The Champion, Bethany was choosing to mark this moment as an empowering experience and time of transformation as she was going to turn 30 this week. This was going to be a time of proclaiming that this next, new decade was going to be one of health and fitness. Friday finally arrived, and this extraordinary weekend was about to begin. 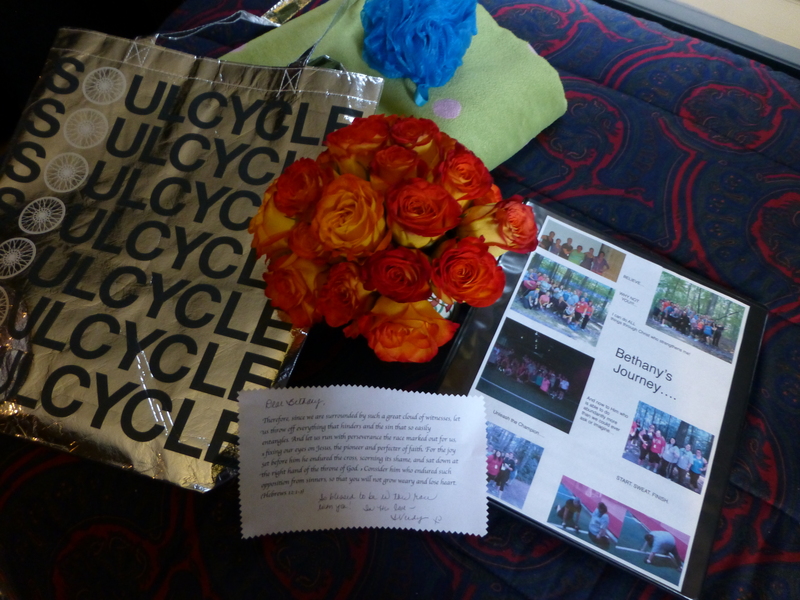 I got the 2 bedrooms all set for their arrival…beautiful flowers by their bedsides, a “Soul Cycle” bag filled with some of my favorite things to share with them, a binder with some pictures of their journeys, filled with some inspiring sayings and things I had learned. I just wanted these 2 extraordinary women to feel cherished and loved…and to just let them know how honored I was that The Lord put them in my life. I reached NYC, and within minutes, I found Roseanne, standing with her luggage, and I just hugged her! I couldn’t believe she was really here! She looked amazing! Once we were situated on the train, we started to catch up, take pictures and begin walking through the weekend that we had anticipated for so long! Bethany’s plane was delayed a bit, so we went ahead to our spray tan appointments, and Warren picked Bethany up from the airport. We shared part of our stories with the people at the spray tan place, and they were just sooo excited for us. Geo, the woman doing the spraying, made us feel so comfortable, and when we came out, we took pictures with her to keep documenting the journey! She told us that she would totally fit Bethany in any time that night,if she saw our tans and decided she still wanted one. Well, when we got home and walked in and hugged Bethany, she really wanted to have it done also, so we jumped in the car and went back. I’m so glad she decided to get it done, it was great to go back and have fun seeing her experience it also. Again, a fun round of pictures, and we went back to have dinner at home. My family was so excited to meet Roseanne and Bethany, especially my parents, as they had heard so much about them. We visited well into the night, and finally went to bed after midnight. If not for exhaustion setting in, I think we could have stayed up all night talking. First thing Saturday morning, we drove to my WW meeting. Another group that was looking so forward to meeting these women whom I had been sharing about fore a long time in my group. We got there early, weighed in and met all the staff, including Elyse, who had been waiting to meet them, especially the “woman that I passed my “believe” bell to”. We took some great pictures all together, before the meeting started. Then Lorraine arrived, and those long awaited hugs took place! 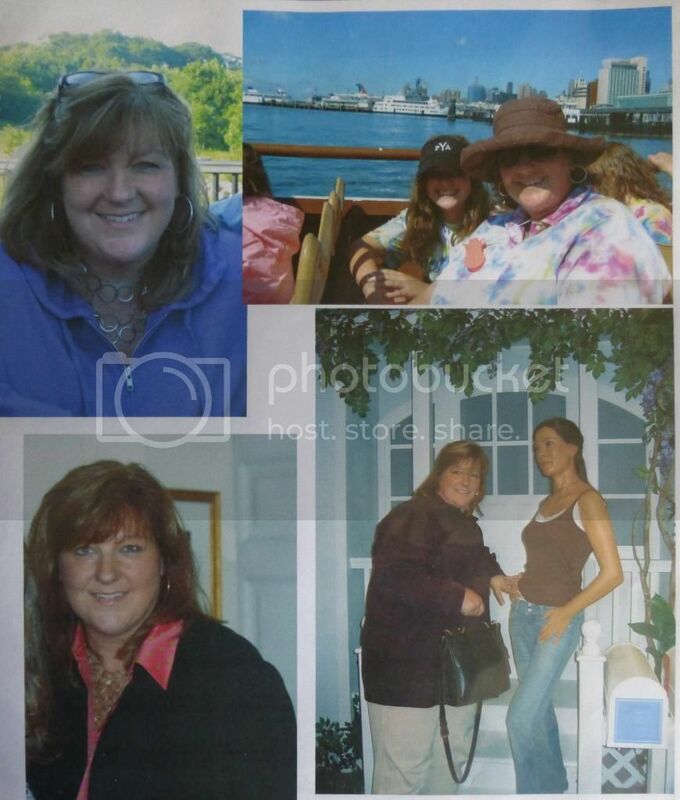 (As I watched Lorraine and Bethany hug, I was taken back to the day on the ranch, in September, sitting at the lunch tables after reading Lorraine’s daily letter to me….After I read it to everyone at the table, and explained that she had written one for every day I was away…Bethany asked, “promise me, that if I ever come to NY, you will introduce me to Lorraine?,(and I said, “I absolutely promise. )….and here they were, 7 months later,hugging each other, on Long Island.. at our WW meeting…ONLY GOD! 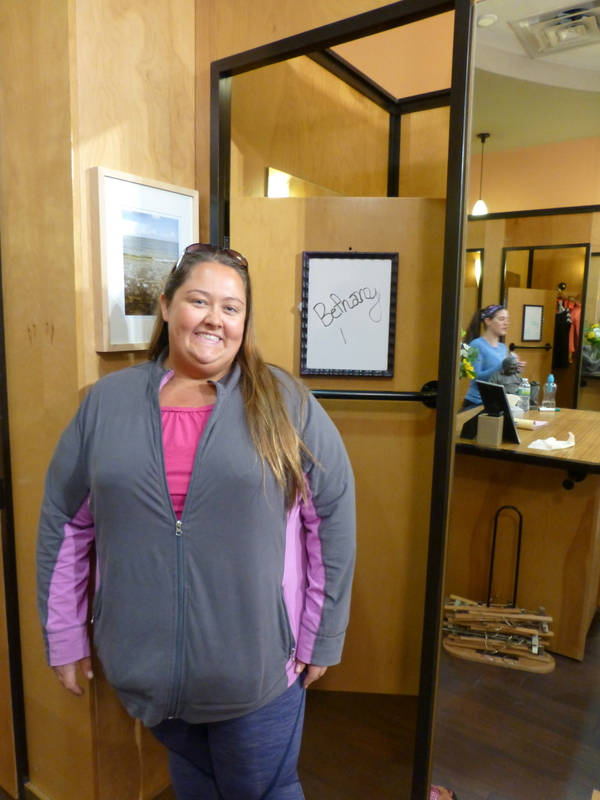 As everyone started to come in, they met them…Elyse lead another extraordinary meeting, and at one point, when everyone heard that Roseanne was over 111 pounds down, they gave her a standing ovation! What a beautiful moment. It was just so special to share this meeting with 2 special friends I had met on a ranch in Tennessee last September, and to look to my right, and see Lorraine sitting in between both of them, it was pretty surreal. 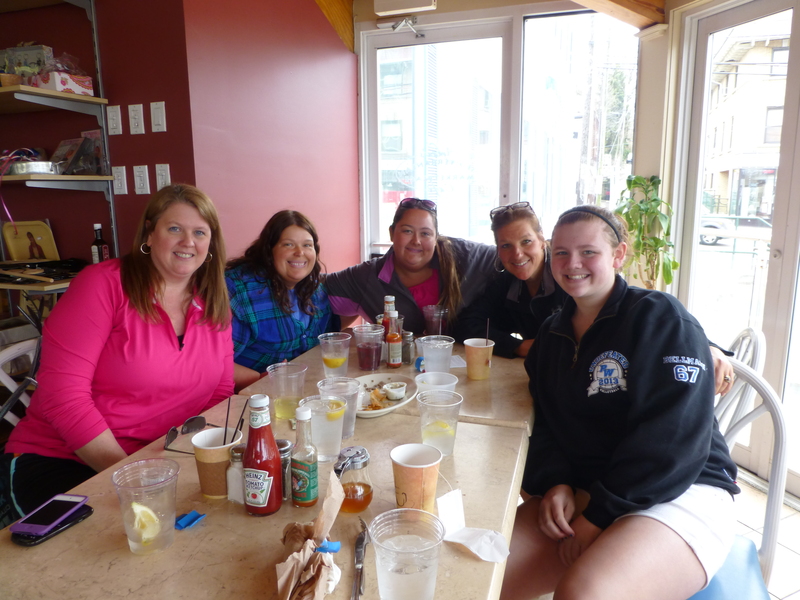 From the meeting, we went out for a great breakfast all together, overlooking the Long Island sound. 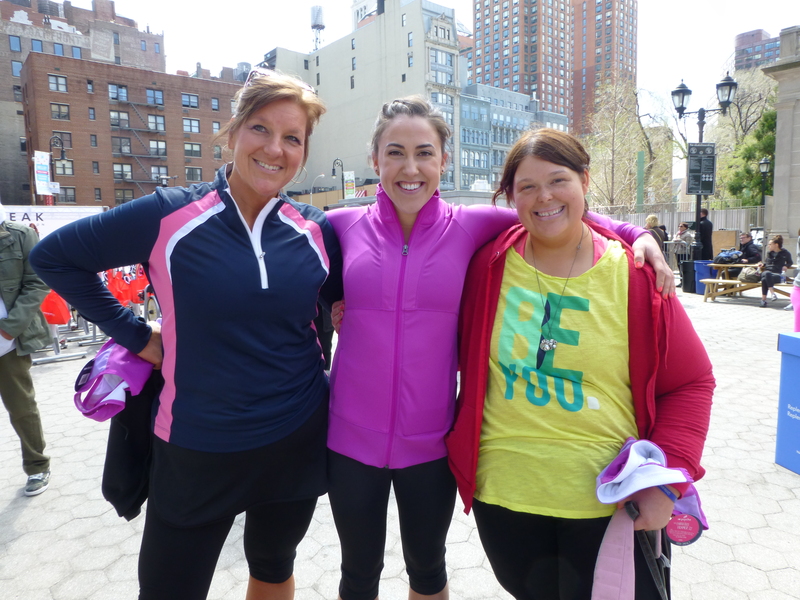 Grace, (my daughter) and Hannah (Lorraine’s daughter), joined us, as they were so excited to be with these women also. 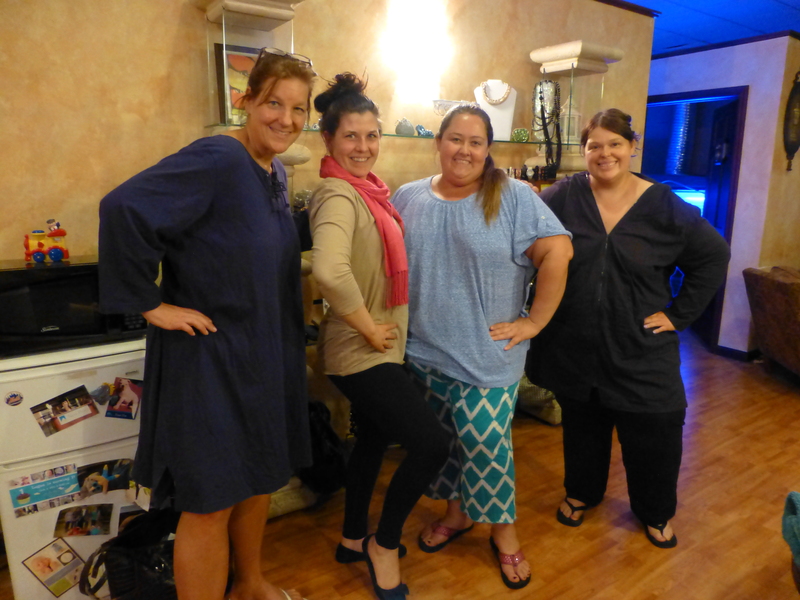 It was a great “girly” time of visiting and sharing. The rest of the day was filled with a bit of touring the area, we did a little shopping and “cruising the Miracle Mile”, as Billy Joel’s song made it famous…from sneaker shopping to Sephora… we even took Bethany to Lululemmon to buy her first pair of work out pants there. We took a ride over to see the gardens of The Swan Club, then picked up some great steaks and food for a barbecue. More great visiting into past midnight, and we decided we really needed to get to bed, the big day was tomorrow! I went to bed praying again that the following day would be all that it was suppose to be. We were all excited, but also very nervous, as we had no idea what to expect. That evening, Lorraine decided to go with us, to be “the photographer” and visit and be a part of all of it, because we read on the website that being in a sports bra was optional, so everyone didn’t have to do it, if you just wanted to be there and experience it. Well, God knew all along that she was suppose to be there, and experience it all with us. There was a point during the day, that she just said how thankful she was that she came, as there was no way I ever could have put into words what happened this day. Roseanne, Bethany and I all walked up to the station to meet Lorraine and catch the train. Thank God Lorraine came with her car. As we came into the station, there was caution tape everywhere and signs that said they were working on the tracks, so buses were running every hour to take you 2 towns away to get on there. If we did this, we were really going to be late. 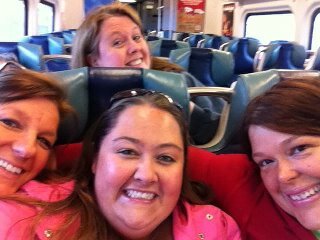 We met Lorraine, jumped in her car, and out ran the train to a station that was 3 towns away, and we made it in time to jump on that train. It was panic mode for a bit! Thank God, if we had to, Lorraine knew how to drive into the city. (something I have never done myself). Taking a breath after finally getting on the train…we were on our way! We were excited to get there and also meet up with Susan and Murn (2 more friends from the ranch), as well as finally meet Jenny Gaither (head of the SEAK foundation and Sports Bra Challenge), as well as say hi to Hannah and Olivia, although we knew that they would really be busy that day. 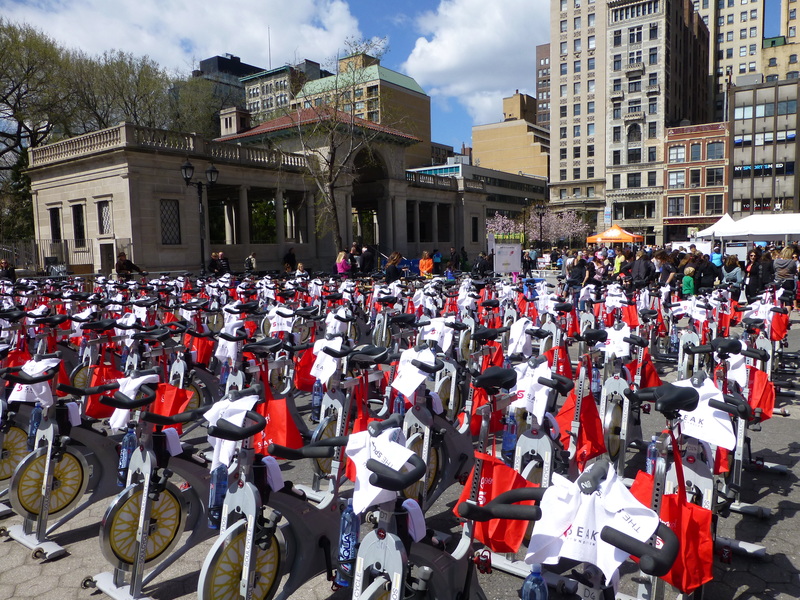 We came up out of the subway at Union Square, and when we came around the corner, we could see the tents and the set up of hundreds of bikes. My stomach was filled with excitement, as well as nerves. It was the most beautiful day, sunny skies, trees starting to bloom a bit… Excitement in the air. We stepped up to the first tent, and we were given our wrist bands. We were told that our bike numbers were written on them. When we walked through the entry way, We saw Hannah and Olivia doing some announcements on the stage. We checked out the different areas, and then visited for a bit with Olivia and Hannah. It was so great to see them, they looked absolutely beautiful. 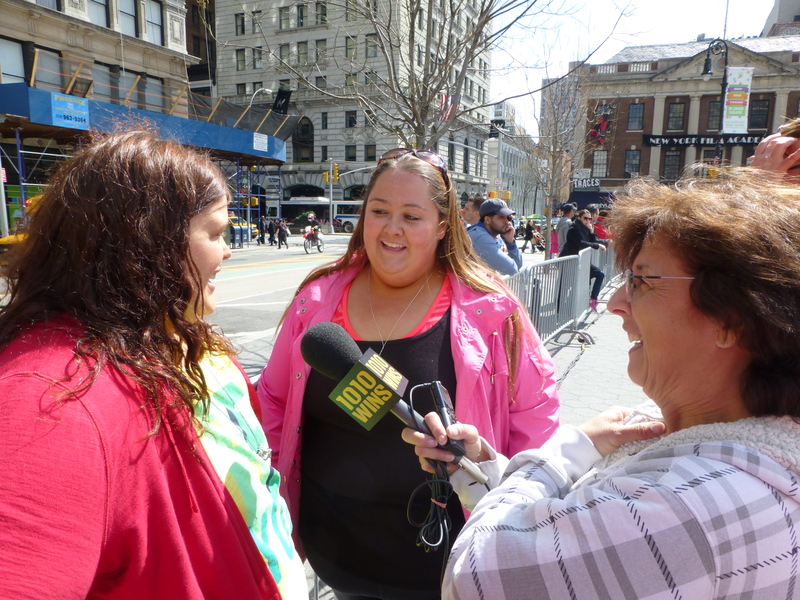 A few of us were interviewed by a woman there, and then while we were hanging out, we finally met Jenny Gaither. It was so great to meet her after talking to her through so many emails. She is one of those people who just brings such a joy and energy onto the scene, along with an encouraging heart and abundant spirit. She is so genuine with everyone she is with. She was in charge of this entire day, down to every detail, and yet no matter who she was with, who was coming up to her, including us, she gave her full time, her huge smile and full interest. Every single person mattered to her, and in such a unique way, full of energy, a smile that never faded….she made everyone feel so special, and that it really mattered that they (we) were there. We took pictures with her, and then she lead us over to the “reveal tent”, where we took some more fun pictures, and shared a little of our reveal. All of the camera men, some of the other Soul Cycle instructors, and Jenny Gaither all took turns taking pictures with us. They truly made us feel like superstars! 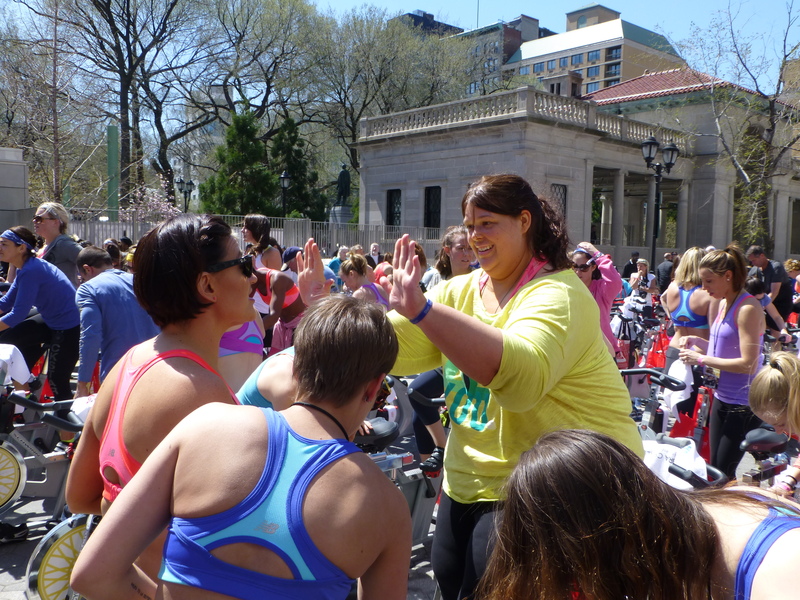 It was also incredible to already be in such a safe environment, where people in all shapes and sizes were walking around in sports bras, celebrating their bodies as they are now….and in the midst of hundreds of people, mostly women, not once feeling judged in any way. That was pretty astounding! What an experience. While we were visiting and talking, and meeting up with our other friends, Murn and Susan, Lorraine was taking lots of pictures, and she made her way over to see where our bikes were, to take a few photos of where we would be spinning. 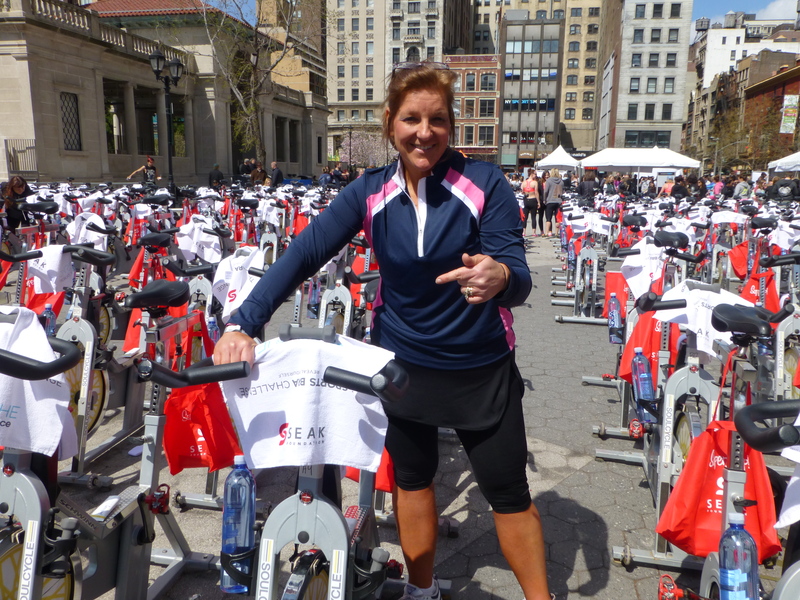 Suddenly, I heard my name being shouted from a distance, and when I looked toward the stage, Lorraine was pointing to a bike in the front row, right in front of the stage, and she was shouting, “you’re in the front row!”….a wave of fear and excitement came over me, as I grabbed Roseanne to go and see our bikes. We walked all the way to the front, and saw A9 and A10…OUR bikes….front row center. Oh my goodness! 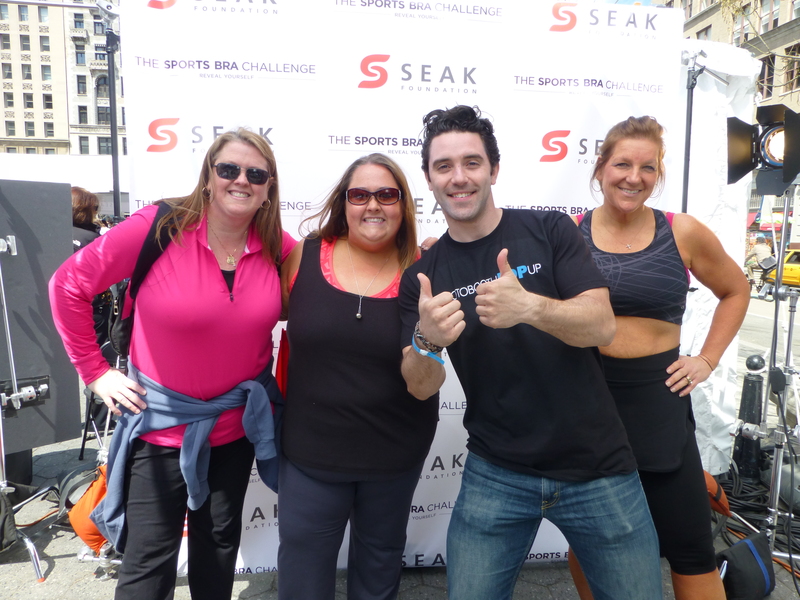 We took a few photos, and then went back to a table to hang out and visit and take some more fun pictures at the SEAK photo booth. 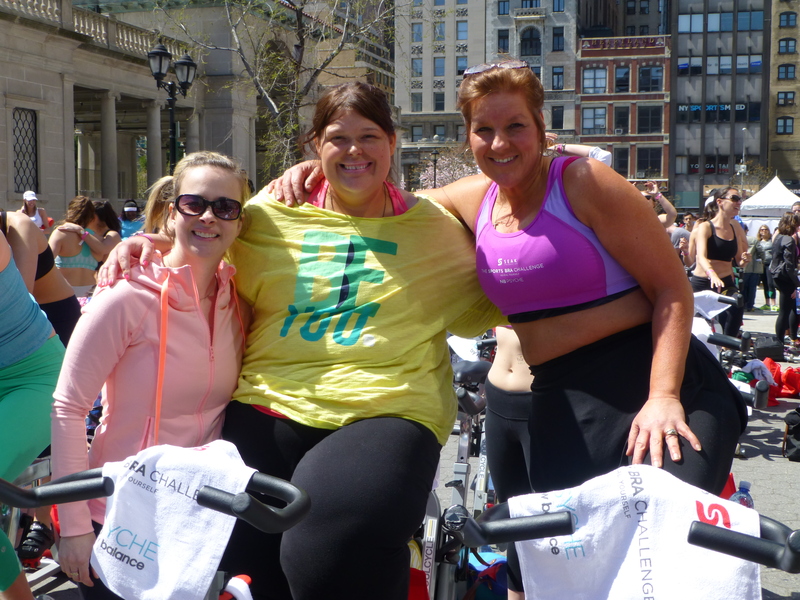 The first Soul Cycle group was called, and we watched them for a while, and we were inspired by everyone riding, and excited to see Hannah and Olivia right up front riding side by side with lots of excitement and joy. 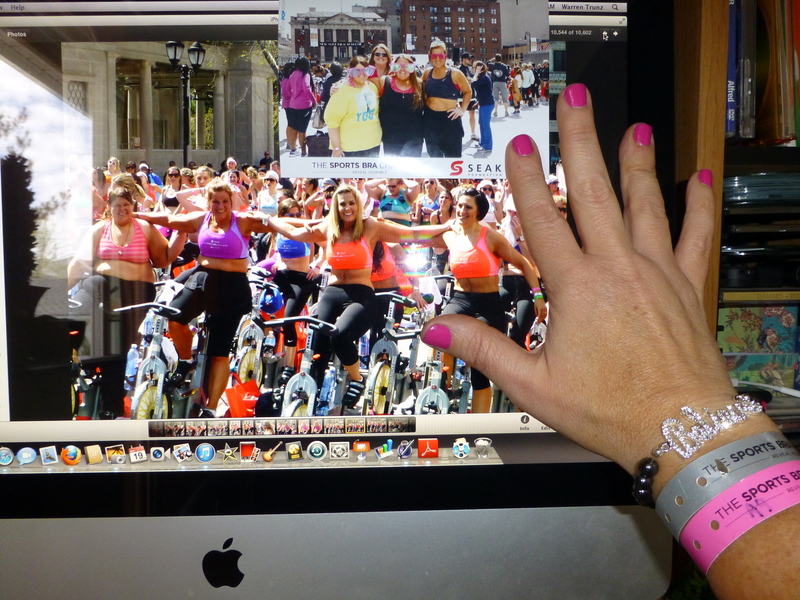 The music was so great, and watching everyone ride, in their sports bras…completely uninhibited, was really spectacular. As the first ride came to an end, I could see Roseanne getting really nervous, and my stomach was full of nerves. My hands were sweating, we started to get into a bit of a panic mode, I started to just pray for strength and courage, and with that, I assured Roseanne that we would be fine. This is what we came to do. It wasn’t a race, it was an experience, and we were not going to miss this amazing experience, and all that it was meant to be for us. 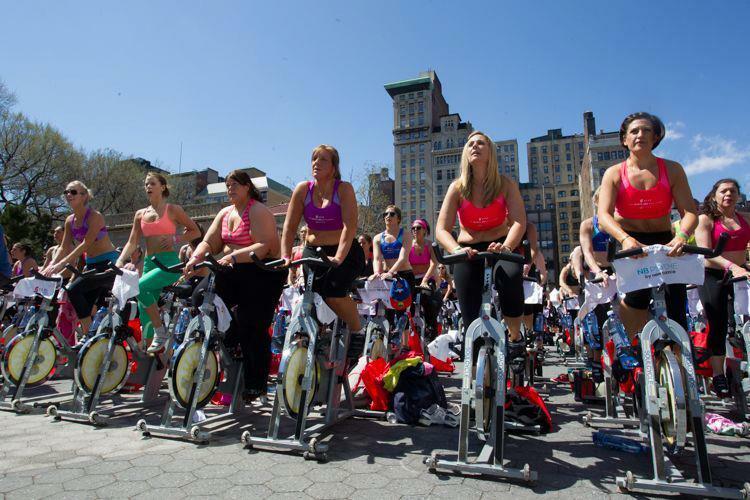 She had never done a Soul Cycle ride, so I assured her that I would be right there, and I could hop off the bike at a moment’s notice and help her with absolutely anything she may need. I told her to just put up 2 fingers to let me know she needed help, and I would jump right off. When our group was called, we brought our stuff up the the front, put our spin shoes on, and there were people to help us adjust our bikes to the right settings. 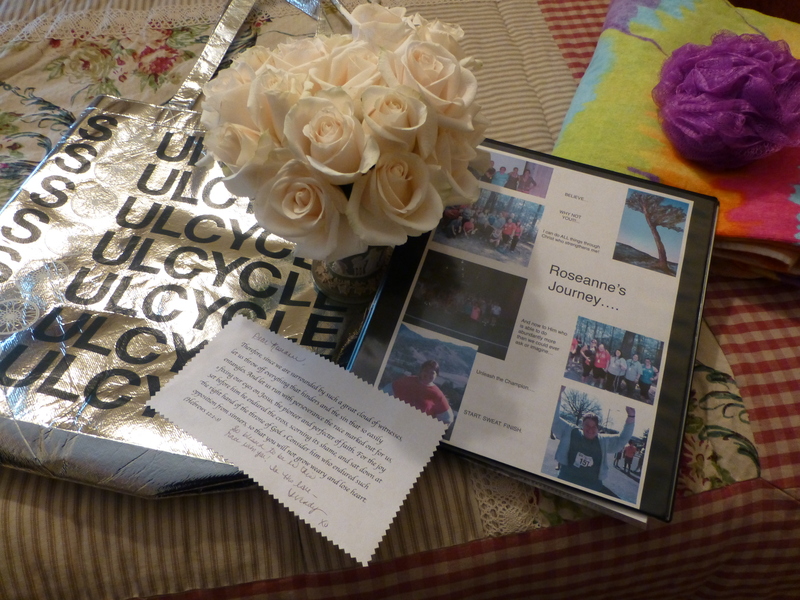 Susan and Olivia also helped Roseanne get all set and locked in, and encouraged her before getting on their own bikes. 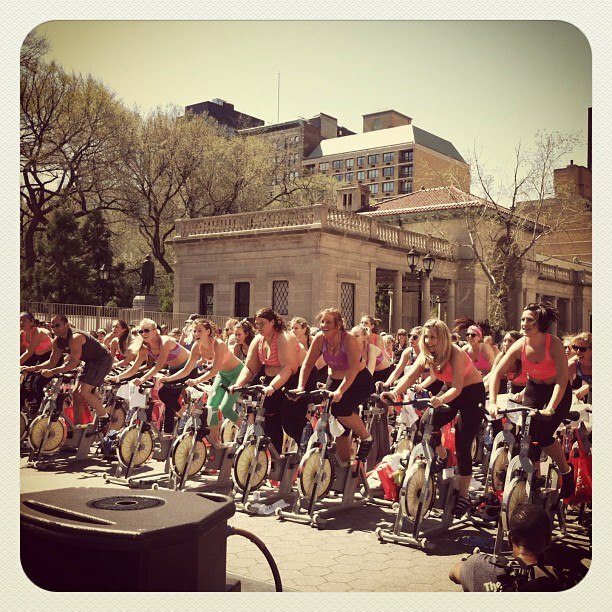 We started to pedal and warm up as everyone got on their bikes. I reminded Roseanne that I was right there and would help her however she needed, and to remember…it’s not a race, it’s an experience. The music kicked in, Jennie and Ayana lead and inspired and rocked it out with everyone there. 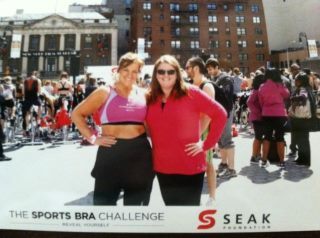 We were stripped down into our sports bras…and we were riding with over 300 people in the middle of Union Square, surrounded by loads of people cheering us on, taking pictures. The atmosphere and energy is something I can’t even put into words, along with going through it, as we all celebrated how far we had come, where we were now…without one bit of judgement amongst every single person there…..just pure celebration! It was unimaginable! It was such a gift! The hour of spinning was really hard, at times when I thought I wasn’t sure I could hang in there, I saw Roseanne pouring out her heart and soul, and she inspired me to keep up and do the same. We spun harder and faster…we put the resistance up higher and higher, we pedaled and did push ups on the handle bars..over and over again…then we took out weights and did some weight training (while our legs never stopped moving)….It was really hard, really intense….and we kept up and did it. When the last song came on, there was a point that my eyes were closed as I was praying for the strength to keep pushing and going…and then all of a sudden, The Lord started to flash my entire journey across my mind, as the words of the song washed over me singing, “anything can happen”…. my mind flashed from watching Olivia and Hannah on The Biggest Loser, to Olivia meeting with me and helping me…to being on the Dr. Oz show and making it from 1.2 million people to the final 20….to the finale of the Dr. Oz show…to going to Unleash the Champion, working out with Carter Hays, some contestants/winners of The BIggest Loser…meeting Roseanne, Bethany, Susan and Murn on that ranch (who were now here with me today)…. And as my whole journey flashed in pieces before me, as my eyes were closed taking it all in, as I kept spinning and pushing…an overwhelming sense of gratitude, joy, love and pure amazement in what I was experiencing at that moment…trying to take it all in….the beauty of the blue sky and weather, spinning this past hour while looking right into the eyes of Jennie and Ayana as they lead and encouraged us and just rocked it out…realizing that I was walking in this dream that I wrote down in a notebook 2 years ago…Roseanne was on my right, 111 pounds down since I put my “believe” bell around her neck after she climbed the mountain at a boot camp we met at last Sept….Hannah and Olivia, winners of the Biggest Loser, who went from superstars onTV to be called our friends… were on my left….we were all together, spinning in the front row, amongst hundreds of people celebrating…. With all of that going though my mind, a huge wave of emotion and tears felt like it was coming up from my toes, through my entire body and then out…my face became distorted, and I just began to cry uncontrollably. It was just overwhelming and beautiful at the same time. I remember just thinking and saying, “Oh Lord, what is this?? You actually placed us in this place, for such a time as this! I NEVER could have imagined this.” It was so mighty, I could barely comprehend it and take it in, but I just kept thanking Him for all that He had done and was doing. At one point. I was crying so hard, and when I opened my eyes as I was facing the ground, there was a huge camera below me taping my emotional breakdown. I tried to get it together, but the tears just kept flowing until the end. When the ride was over, I threw my arms around Roseanne. I was soooo proud of her. She kept up, stayed so strong and pushed through every tough moment…and she made it to the end victoriously! 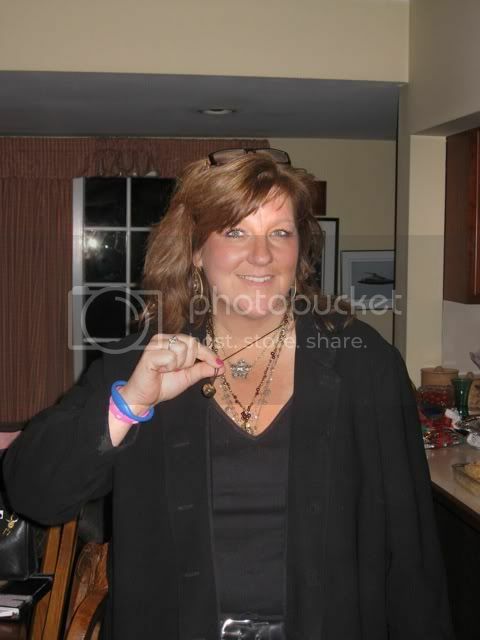 There were so many times during that ride, I just thought, she is one of THE most courageous and bravest women I know! And to experience this day riding next to her, was the most amazing gift ever! She is a superstar! As we gathered our things, the photographer who was filming during the last song asked if he could interview me and find out why I was so emotional during the last song. I got myself together and met him back by the tents, and Roseanne and Bethany and I were able to share a bit of our stories with him. It was very emotional for all of us. I remember just stopping and looking all around to take it all in one last time. People were celebrating, cheering others on, congratulating one another…we were surrounded by hundreds of people just celebrating their bodies, taking part in this amazing foundation to support all of the efforts to support women in building the confidence they need to feel empowered and beautiful in their own skin. 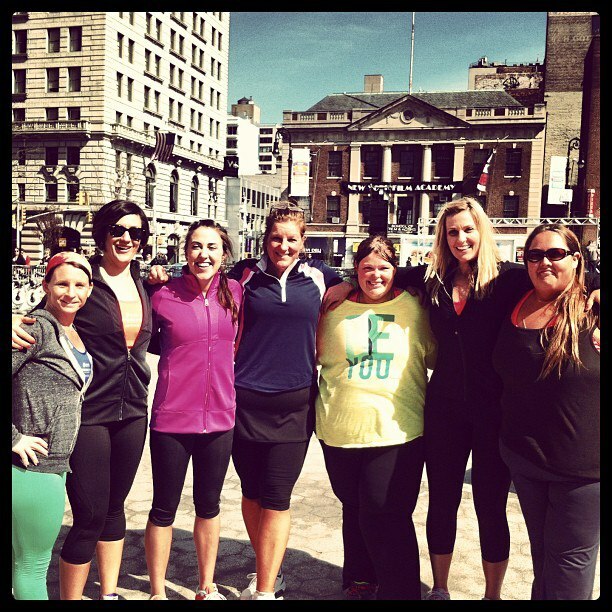 This experience…this day, truly was ABUNDANTLY MORE than I ever could have asked for or imagined. And the amazing thing to me, as I continue this journey, is realizing, and being grateful for the fact that, although it was 2 years ago, 81 pounds ago…when I shut all the shade, locked the doors, and did the challenge in my own home privately, while I prayed to be able to one day experience it in person…God was already working on it, and orchestrating everything, down to every incredible detail of this day…and was just waiting and smiling as we walked through this entire day, in utter joy and amazement…completely awestruck as we finally met everyone there, who made us feel so special…and rode on our bikes, A9 and A10, right in the front row…with Hannah and Olivia on my left and Roseanne on my right, Sue and Murn riding behind us..Lorraine and Bethany photographing us and cheering us on…being lead and encouraged by Ayana and Jenny…surrounded by the energy, joy, courage and excitement of hundreds of people, with not one person judging another. When I think about his day, all I can do is keep praising God for His abundance! Prayers unleash the power for dreams to come true! Keep dreaming big dreams…and pray without ceasing..and know beyond a shadow of a doubt that He is able to do ABUNDANTLY more than you can ever ask or imagine! This entry was tagged 3C wellness, Biggest loser, Dr Oz, Exercise, Faith, Faith To Fitness, first experience, friend lorraine, hannah curlee, health, healthy-living, home, Jenny Gaither, Olivia Ward, SEAK Foundation, Soul Cycle, spinning, sports bra challenge, Unleash The Champion, Weight Loss. 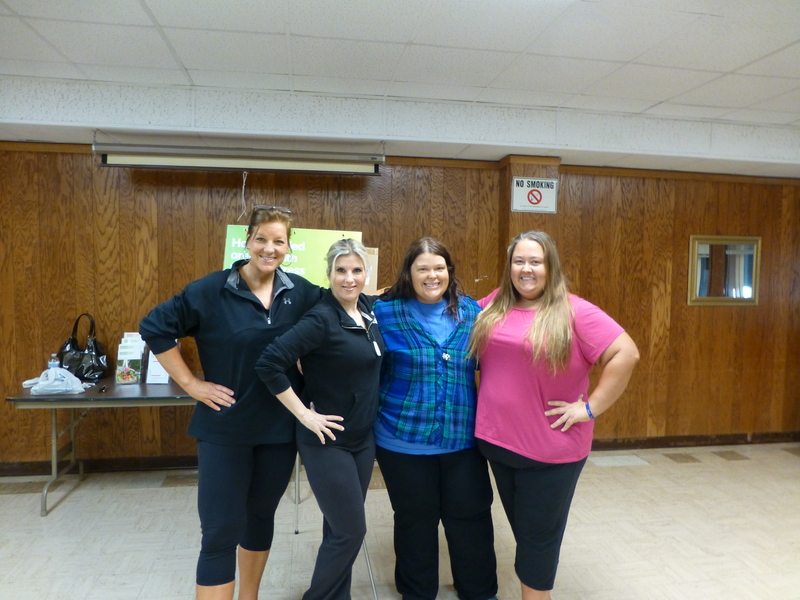 I often have taken Zumba with you and Holly. I have dark curly hair and I am a big fan. I share your stories with others. 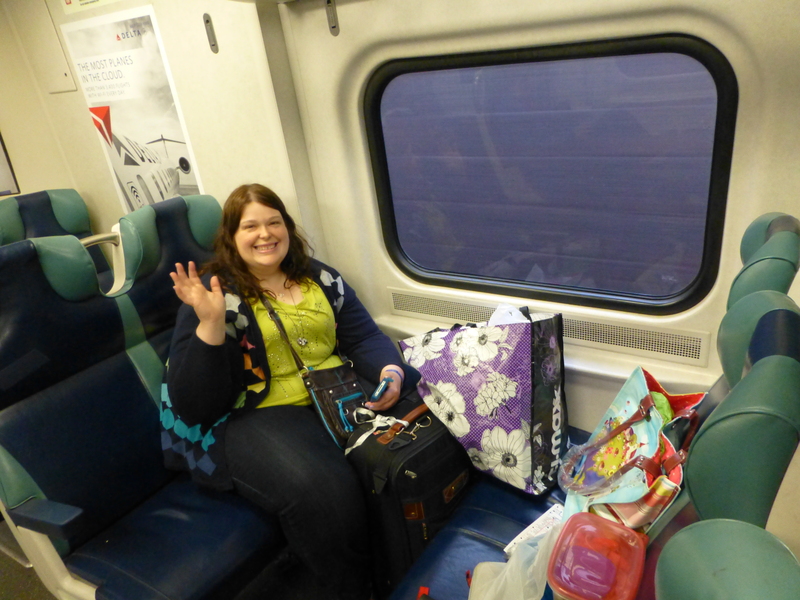 The day your family took the train, to give away your coats is very much a favorite. Thank you so much for sharing this incredible story. I will be back to Zumba in the fall. Can’t wait to hear, see, and read what you have been up to.